Do you try to make a logical decision or simply trust your instincts? Think: Quick! Our heart begins to race, palms moisten, and the mind tosses about options at an epic speed. With time counting down, the decision must be made: instinct or logic. These are familiar situations for all of us, be it while driving, making financial decisions, or reacting to a relationship issue. No matter the situation, learning to trust our instincts is a valuable tool. How often do we trust our first instinct? If we never trust this impulse, we must question: what have we learned from our experiences? Gut feelings are referred to as interoceptive sensations. [Often referred to as the eighth sense.] Interoception is the ability to sense physiological signals originating inside your body, such as heart rate, temperature, hunger, pain, etc. 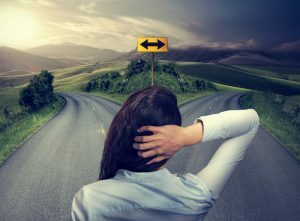 Numerous studies demonstrate how humans who have a greater connection to interoceptive signals perform to higher standards in risky decision-making than those who are less connected. According to a study performed by researchers at the University of Cambridge, financial traders are better ‘gut feeling‘ decision makers than the general population. Trusting intuition is developmental. From an early age, children learn from errors and take the experiential education into adulthood. If humans are forced to behave in unhealthy ways, or deterred from feeling or expressing emotions, intuition can be silenced, especially during the developmental ages of 6 and 16. If one is not allowed to healthily process and express mistakes or missteps, they may lose or decrease their ability to connect with interoceptive sensations. Take a deep breath. Being in a relaxed state enhances our ability to make better decisions. Clear your mind and give yourself the chance to listen to your heart. Recall a time you felt gutsy and determined in spite of your fear. Remember the moment you moved forward, took action, or spoke your mind. When we can list the times we made gut decisions with positive outcomes, we are more likely to take action on the current decision being disputed. Be aware of your feelings. Do a body scan of your feelings. Understand where you feel the impulses and be able to identify your emotions so that when you are in these situations again, you become comfortable. Use those skills of emotional labeling to get in touch with what your gut might be saying to you. This entry was posted on Wednesday, May 3rd, 2017 at 12:46 pm. Both comments and pings are currently closed.